(28 March – Cropchoice News) -- Saudi Arabia has followed the Dutch government in banning canned tuna imports from Thailand. Why should US farmers – and markets - care? 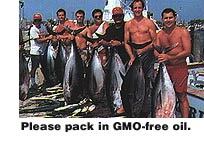 The Saudis and Dutch have imposed the bans because the Thai tuna is packed in oil from glyphosate resistant soybeans. Other Middle Eastern countries may follow Saudi Arabia’s lead. Thailand in a big importer of US soy products. In 1999, Thailand imported over $178 million worth of US bulk beans and soymeal. The bans will likely lead to reduced Thai demand for US GMO soy. The tuna bans have serious implications for Thailand. Some exporters have had to recall products. According to the Bangkok paper Business Day, in one recent case the Saudis rejected a US $2.6 million dollar shipment from a major Thai tuna packer because of GMO soy oil contamination. The Thai government is developing standards and labeling, while Thai companies are looking for non-GMO soy sources. Saha Industries, a Thai chicken exporter, said that it won’t wait for government action. With millions of dollars of exports on the line, Saha said it will immediately spend $260,000 to set up a testing lab to insure its soy supplies are GMO-free. Part of the Middle East's reluctance to accept biotech food is because many Muslims consider GMO products to violate Halal food laws. Islamic countries have played active roles on labeling and other issues in the "Codex Alimentarius" international food negotiations.